CES Plague: I Have Mucus To Spare. Who Else Got Sick? 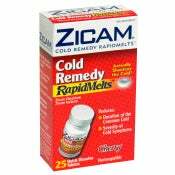 These little miracle pills to the right are Zicam Rapidmelts. Per my email to the Gizmodo CES team, entitled "Battling Fatigue"
I recommended them with the endorsement "I've used them for the last 2 years, and have had 1 cold over that time." But when you throw in Tokyo jetlag, plus, Macworld/CES, claims like these go out the window. My mucus is as green as a bar of Irish Spring. So I know this is a niche question, but given that the CES attendance was at or around 100,000 folks[Too Lazy to Google, FYI], its worth asking who's infirm and who's of solid body. Ryan Block told me at the airport that none of the Engadget blogging cyborgs went offline, while Dave Zatz got sniffles. Our own Charlie White almost made it through the trip, only to let a night of gambling pull him down. Who else went and got the plague?